Welcome to Tim Valentine's website. "If there's a better piano player on the planet I haven't heard them." Tim is an international pianist, based on the Berkshire / Oxfordshire border in the UK, who has entertained everywhere, from the oceans of the world, to the local streets. 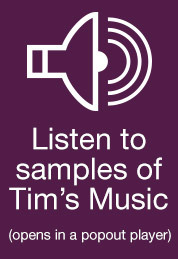 His style is unique, and although he is unable to read music and having taught himself "by ear", Tim's music is loved and appreciated by the widest range of people, from playing to guests on luxurious cruise liners, to busking for shoppers in town. His unique sound has brought pleasure to thousands, from sing-a-long audiences on honky tonks, to performing on Liberace's personal Grand Piano in The Palace at Sun City, South Africa. His piano playing ability encompasses all ages, from playing at children's parties, to entertaining the elderly in care homes. And if you don't have a piano, it matters not, Tim will bring his own. He has 3 available choices, a Yamaha Grand Piano, a Roland Electric Piano and his most popular Busking Piano, which travels around with him, which he has especially adapted to take almost anywhere, and is designed for playing outside in all weather conditions.